What Else Can I Expect From an Online Associate in Medical Office Administration Program? 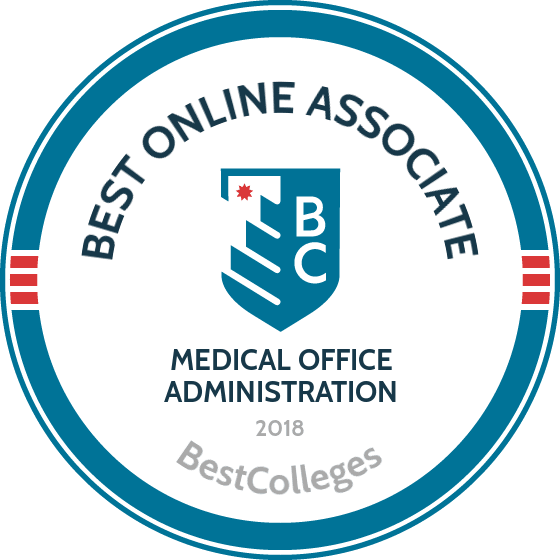 What Are The Best Online Associate in Medical Office Administration Programs? What Can I Do With an Associate in Medical Office Administration Degree? Medical office administration is the day-to-day business of keeping healthcare facilities running smoothly. Working directly with clients and behind the scenes, professionals in this field ensure that all your health records are confidential and that routine doctor's visits are kept hassle free. If you are considering a career in this field, an online associate degree in medical office administration is suitable preparation. Associate-level degrees can usually be completed quickly, and you'll learn valuable, in-demand skills that will help you land a job after you graduate. The healthcare field is experiencing a period of strong growth, owing to an aging population and changing practices brought on by industry-wide adoption of new technology. The U.S. Bureau of Labor Statistics projects a 23% increase in the number of available medical assistant jobs between 2014 and 2024. This is far above average projections, which is good news for students just entering the field. Full-time students can usually complete an associate-level medical office administration online degree in two years or less. Some programs, especially those tailored for students who have already completed college-level coursework, can be completed in around one year. To graduate, most online colleges for medical office administration require students to complete between 60 to 64 credit hours of coursework. The number of credit hours you take in a given semester will depend on how your program is structured and how quickly you plan to finish your degree. The top online colleges for medical office administration have tuition rates ranging from about $200 to about $800 per credit hour. In addition to national and region-specific accreditation, students should look for programs endorsed by the Accrediting Bureau of Health Education Schools. Some programs require students to complete work placement practicums to qualify for degree completion. The online associate of applied science in medical office administration at Pitt Community College, located in North Carolina, provides students with the education and training needed to be successful administrators in healthcare environments. The curriculum focuses on areas such as medical terminology and legal issues and ethics. One of the best online colleges for medical office administration, PCC preparing graduates to work for hospitals, dental offices, insurance companies, and medical supply companies. Distance learning at PCC is delivered using the Moodle learning management system. Students interested in applying to this online associate degree in medical office administration must submit a high school diploma or the equivalent. The school accepts some transfer credits from other postsecondary institutions; these are awarded upon review of a student’s transcripts. In addition to traditional financial aid options, such as loans and grants, PCC offers a tuition payment plan. Surry Community College is one of the top online colleges for medical office administration. Based in Dobson, North Carolina, this institution offers eight fully-online degree programs, including a 67-credit associate of applied science in medical office administration. Coursework includes general education classes in writing, math, and the humanities, in addition to major coursework that covers a range of topics, including word processing and medical terminology. Upon completion of the program, graduates are well-versed in Microsoft Office programs, can demonstrate effective communication skills, and have mastered the ability to create the letters, reports, tables, and other documents required in the medical profession. Distance learners have access to tutoring, an online bookstore, placement testing, and veterans services. Students are eligible for a variety of financial aid options, including grants, student loans, and payment plans. Students interested in working as administrators in medical offices can enroll in Lenoir Community College’s 73-credit associate of applied science in medical office administration; this degree can be earned remotely. The school is one of the best online colleges for medical office administration in the country and offers a curriculum that teaches students about medical coding, insurance, and billing. Graduates are prepared to work in hospitals, insurance companies, medical supply companies, and lab spaces. LCC’s online programs are delivered through the Moodle learning management system. In addition to online support services, such as tutoring, academic writing assistance, and advising, the institution provides distance learners with career coaches who help students as they apply for jobs. Financial aid options for distance learners include federal loans and institutional scholarships. Guilford Technical Community College, located in North Carolina, offers a number of online degree options in healthcare and office administration, including a fully-online associate of applied science in medical office administration. Students learn about medical billing and coding, patient services, and medical documentation. Graduates are prepared to work as medical administrative personnel. The 66-credit curriculum includes classes that focus on electronic health records, medical terminology, office finance solutions, office applications, emerging technologies, and office editing. Students also take courses in math, the humanities, communications, and social and behavioral sciences. Distance learners pursuing this medical office administration online degree are also prepared to sit for the Microsoft Office User Specialist Exams. Online programs at GTCC are delivered through the Moodle learning management system. Admission into the program requires a high school diploma or the equivalent. Online colleges for medical office administration prepare students for careers as medical assistants, medical records and health information technicians, and medical transcriptionists, among other related positions. Detail-oriented candidates with strong organizational and interpersonal skills, and solid keyboarding and computing abilities are well-positioned to succeed in the field. Medical assistants oversee administrative functions in hospitals, clinics, and private medical offices. They also interview patients about the purpose of their visits, review and record patient medical histories, and help prepare patients for physical examinations. In many professional settings, medical assistants handle billing and insurance processing. This specialized career path focuses on organizing, administering, and managing health information and patient records. Health information technicians ensure pertinent data is well-organized, accessible, and secure. They also use a range of coding and classification protocols to track patient treatment histories, supervise insurance claim processing, and manage medical registries and databases. Many physicians dictate patient information into handheld recording devices. Medical transcriptionists use these recordings to generate accurate and detailed written reports, which are then added to patient files. Transcriptionists frequently employ voice recognition software to assist them, but require advanced interpretive skills to translate the shorthand terms physicians often use. Because of the high demand for administrative healthcare workers, there is a healthy job market for both associate and bachelor's degree holders. Some who have already earned their associate degree may choose to transfer into a bachelor's program in medical administration to position themselves for future career advancement. You can also combine a bachelor's degree in medical administration with a concentration or minor in business, which can enhance your employability. Bachelor of Science in Healthcare Administration and Management: Delving deeper than the core competencies of the average medical assistant, B.S. programs in healthcare administration and management introduce students to advanced administrative practices used in both public and private healthcare settings. Policy development, healthcare technologies, and facility management are among the topics covered in these programs. Bachelor of Science in Health Information Management: Students in baccalaureate-level health information management programs learn to analyze, manage, and protect patient data. Students apply advanced informatics skills to improve workflow patterns in clinical settings. Professionals in this field often function as liaisons between administrative, clinical, and operational job categories. Bachelor of Science in Healthcare Business Administration: Balancing a healthcare organization's ethical obligations and financial needs requires business acumen. B.S. degrees in healthcare business administration prepare students for mid-level careers by focusing on resource management, organizational administration, healthcare-specific business practices, and leadership. In the past, it was common for medical office administrators to enter the field with a high school diploma or GED, and advance through on-the-job training. The employment environment has changed significantly in recent years, and postsecondary education is now considered a basic requirement for entry-level positions in the field. Professional organizations can be a valuable tool for students, recent graduates, and entry-level employees. Through these organizations, you can attend industry events and training programs that increase networking opportunities and improve career prospects. Membership in these organizations is also attractive to employers, as it signals a commitment to career-long professional development. As a member of a professional organization, you will get up-to-date information on employment trends, applicable legislation, and technological advancements affecting the industry. AAHAM focuses on healthcare institution revenue cycles, and works in both the public and private sectors. Affordable membership provides members with access to a wealth of advanced information that helps solve real-world management problems and challenges. Organized into committees, AHCAP brings upper-level healthcare administrators and upwardly mobile working professionals together. It maintains a core focus on professional development through educational and leadership training initiatives. The HCAA aims to connect healthcare administrators both formally and informally. Through a number of networking events and professional workshops, the HCAA helps members improve their core skill sets and stay engaged with important industry developments. Even though many online degree programs are more affordable than their traditional on-campus counterparts, students commonly require financial aid. Be sure to contact the financial aid departments of the schools you are considering to see what assistance they offer beyond the standard set of federal loans and grants. It is generally best to exhaust all possible government sources of financial aid before looking into private loans and funding sources. To that end, be sure to complete a Free Application for Federal Student Aid (FAFSA).